Or you could stay in and enjoy the generous, homely atmosphere of the unique, intimate hotel. Check your emails at the guests’ computer or via free WiFi after breakfast, unwind at the sparkling pool or enjoy a quiet read in one of the comfortable lounges. Have a light lunch in the beautiful tea garden before taking a stroll through the lush, well-manicured gardens. Sip a sundowner while appreciating the stunning views from the Victorian veranda, then enjoy a delicious dinner at the restaurant – with a special bottle of wine from the cellar. Close off the evening with a nightcap at the bar before heading to the comfort of your en-suite room. This is your special break away, and everyone at Falcons View Manor will be sure to make your stay a memorable one. 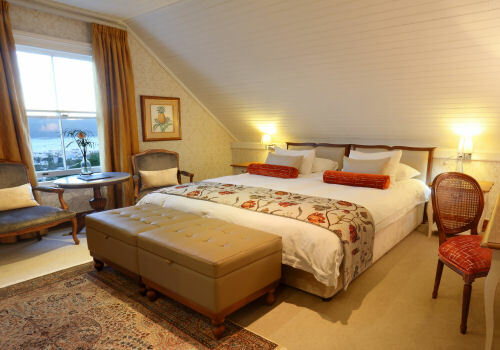 Falcons View Manor welcomes guests to enjoy their stay in either a Manor Room inside the Manor House, or a Garden Superior Room in the Coach House. 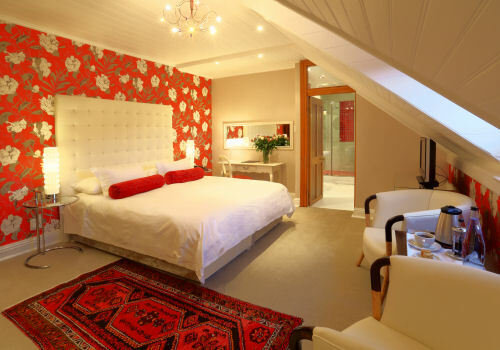 Or treat yourself to a stay in the luxurious and exclusive Garden Superior Suite.